Play baccarat online at the best online casinos available on the Internet. 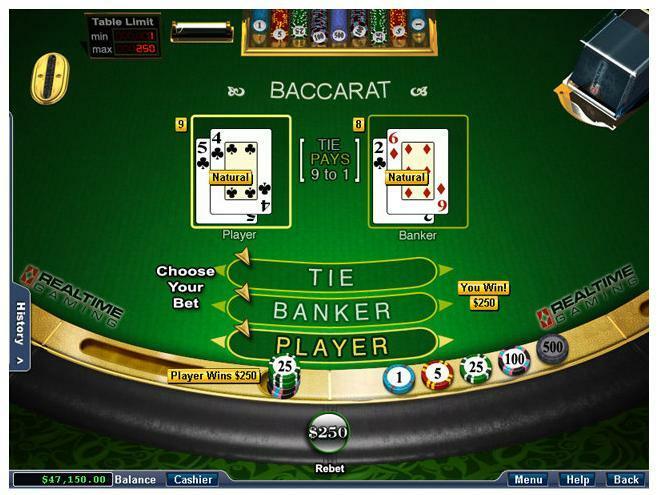 Baccarat is a popular game both online and at land casinos. It is an easy game to learn and the house edge is pretty low. Play online baccarat at the best online casinos from the comfort of your own home. Play standard online baccarat or live dealer baccarat where you can see the dealer and the game over a live streaming feed. Use any of the above online casinos to play baccarat online. All have excellent software and offer a great online baccarat experience. You can also use a live online casino and play baccarat against a live dealer. Watch the dealer and the game in real time over a live streaming feed. Be sure to use our links when signing up to be sure you are receiving the best bonuses available. Playing online baccarat is the same as playing at a brick and mortar casino but you get to do so from the comfort of home. Baccarat is easy to learn and a game all about streaks and luck. If you get on a hot streak you can win a good deal of money. In Baccarat there are three bets you can make. You either bet on the Dealer, the Player or bet the game will end in a tie. Player bets pay even money while dealer bets pay 95% of your wager. If you bet the game will result in a tie and you win you will be paid 8-1. The object of baccarat is to get as close to 9 as possible through adding up the total of your cards. All face cards count as zero, Aces count as 1 and all other cards are face value. To determine your total you add all the cards together and only use the right most digit. For example if your cards equal 14 your total is 4. If your cards equal 11 your total is 1. After the hand is played, whoever has the highest total closest to 9 wins. Again if the Player and Banker have the same total it is a tie. To start the game both the Player and the Banker are dealt two cards. If the Player or Banker is dealt a total of 8 or 9 with their first two cards this is called a "Natural" and the game ends there with the higher hand winning and being paid. The type of Baccarat played online and at most land based casinos is actually called North American Baccarat or Mini Baccarat. This type of Baccarat is strictly a game of chance and there is no skill involved. Both the Player and Bankers decisions are forced by the cards they are dealt. In this type of Baccarat all you do as the bettor is decide where to place your bet i.e. Player, Banker or Tie, and the rest of the game is fully automated with the Player and Bankers hands being determined by a set of rules explained below. The set of rules used are based of a mathematical formula which gives the Banker a small advantage of about 1%. After the Bankers turn is complete the game is over and the winner is the person with a total closest to 9. If you bet the Player and the Player won you would be paid even money. If you bet the Banker and the Banker won you would be paid 95% of your bet. The 5% commission paid on Banker bets is the casinos advantage or "House Edge". Because the game is determined by the rules above, as a bettor you win money "guessing" who will win, the Player or Banker. In Baccarat you can see long winning streaks by either the Player or Banker. We have seen streaks as long as 20 winning hands in a row for either the Player or Banker. Many players will keep track of who wins each hand and then bet accordingly on who he thinks will win. For example if the Banker just won 3 hands in a row, you may want to bet on the Player. Another Baccarat strategy, and one I use myself, is riding the winning streaks and using a progressive betting system. When I play I hope either the Player or Banker will go on a long winning streak and I will win 8 or more hands in a row. I will also increase my bet as I win more hands in a row. Sometimes I just increase my bet what "I am feeling" at the time, and other times I will double my bet every other hand. By using a progressive betting system and getting on a long winning streak you can win a lot of money. You can also one of the live dealer casinos we recommend to play baccarat against a real person over a live streaming feed. The same rules as above apply, but you watch as the dealer deals the cards and the game is played out based on the rule set. If you like to bet big check out a live table. In live dealer Baccarat you can bet as much as $5000 per hand. Most online casinos also offer bonuses when you sign up as new player and then also when you re-deposit. Be sure to use our links to make sure you are receiving the best baccarat bonuses available. One thing to be aware of when claiming a bonus to play baccarat is that baccarat play only counts as 1/4th of your play towards clearing the bonus. That is for every $1 wagered, only 25 cents counts towards clearing your bonus. This is simply because the house edge is so low in Baccarat. In theory, if you bet the Player every time over 100 hands dealt, you would win 49 of them based of the Bankers 1% advantage. Because you win almost as many times as you lose, you must play more Baccarat to clear your bonus, in fact 4 times as much as other games which count dollar for dollar for clearing your bonus.